Robert Neville is the last man on earth. But he’s not alone. An unstoppable plague has devastated the world’s population, killing millions and transforming the survivors into ravenous night-walkers, thirsty for blood. No one is left unscathed. No man, no woman, no child. Miraculously immune to the plague, Neville is a hunter-gatherer by day – stalking the undead as they sleep, and collecting any useful supplies he can get his hands on. By night, he barricades himself in his house, hoping for dawn. His chances of surviving this murderous new world grow smaller by the hour, and he knows it’s only a matter of time before they catch him. Or drive him insane. Whichever happens first. I’ve experienced both now – the movie and the book. And though they differ from one another quite a bit, I can honestly say I have a deep appreciation for both. I appreciate the movie for its sophisticated rumination on grace, faith, and redemption. I appreciate the book for its intriguing scientific-backdrop, gripping psychological study, and for the clever (and grimly ironic) nature of its conclusion. The uncertainty of survival – and hints to the dreadful consequences of a single misstep on Neville’s part – are both ominously present in that sentence. And as we read on, we feel a perversely compelling certainty that this story can’t have a “happily ever after” sort of ending. It doesn’t. I won’t spoil the finale for you; suffice it to say, it’s pretty bleak. Not hopeless per se, but not exactly hopeful, either. It does, however, prove fitting within the story’s (already bleak) context – and you’ll never look at the title the same way again. 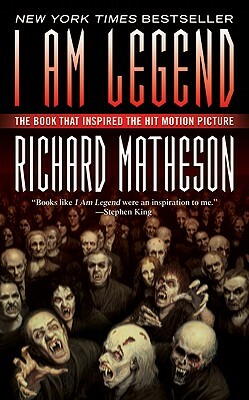 As the tale progresses, Matheson – through the character of Neville – establishes a fairly plausible scientific explanation for the vampires’ existence. I thoroughly enjoyed that part, and if that sort of stuff interests you, I’m sure you’ll find it fascinating. Most interesting (for me, at least) was “watching” Neville cope with his aloneness. For years, his thoughts have been his only company. No contact with another living being whatsoever. That, combined with the constant threat of violence and death, has begun to take its toll. Neville’s cynicism and outright despair are not surprising, but I couldn’t help but wonder how a man with faith in God might respond differently under the same circumstances. Neville has nothing outside of himself to turn to, because he believes there isn’t any such thing. There’s just him. And the vampires. And the certainty of dark and lonely end. Do I recommend I Am Legend? Yes. It’s not particularly fun reading, but it is engaging and thought-provoking, and will give rise to plenty of interesting discussion. I should add that it’s not a book for younger readers: aside from the disturbing premise, it also has several scenes of violence, a smattering of language, and some sexual themes.